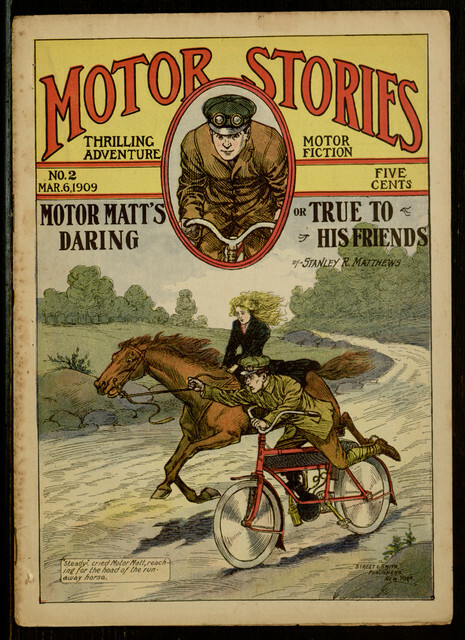 Less than a month after the release of Motor Matt; or, The King of the Wheel, the second volume of the Motor Stories dime novel series has also been made available as an eBook. Motor Matt’s Daring; or, True to His Friends offers more of the same fast-paced, technology-driven action as the previous volume, this time featuring a story about a disputed gold claim. As before, the main adventure is supplemented by a short, unrelated (and unpleasantly racist) adventure story, this time centering on a dangerous night-time journey through an alligator-infested swamp to intercept a murderer. Stay tuned for more Motor Matt adventures in the months to come. For now, you can find the full text of this issue online at Project Gutenberg, where it can also be downloaded in a variety of popular electronic formats.